The Thames runs south into Oxford. As the it approaches Oxford it becomes wide, with low-lying meadows. The river is now 76 metres (250 feet) wide. 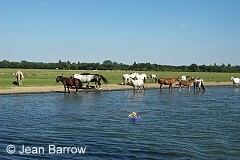 Port Meadow is an ancient area of grazing land, still used for horses. The 342 acre of grassland was given to Oxford as a common by William the Conqueror. The ground has never been ploughed or built upon. Two hundred Oxford freemen and the commoners of Binsey and Wolvercote can graze their animals on the land for free. 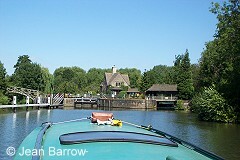 The Thames curves round Oxford, supplying the city's water from the Farmoor Reservoir. Oxford is the first city from the source on the River Thames. 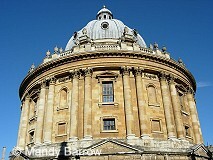 It is famous world wide for its University, the oldest university in the English-speaking world. For over 800 years, Oxford has been a home to royalty. The first known settlement here grew up in the 8th century around a priory close to a crossing point in the Thames. The settlement was then known as "Oxenaforda". Oxford's name comes from the crossing point (ford) across the Thames. The ford was used by cattle farmers to drive their oxen to market. It is the combination of the words 'oxen' and 'ford' that give Oxford its name. On the southern edge of the city the Thames is joined by the River Cherwell (pronounced Char-well), one of its major tributaries. At the time, these rivers would have been one of the only forms of transport. Punting on Oxford's rivers is a popular recreational activity. The punt is a shallow-bottomed boat propelled with the aid of a long pole. Punts would originally have been used by local ferry men to carry goods and passengers on the river. Leaving Oxford the river Thames flows south-east through several miles of open countryside passing through the picturesque Iffley lock before reaching the market town of Abingdon. People onced crossed the river by using a ford. We can tell where these fords were because the towns and villages have 'ford' in their names. See how many you can find as you continue following Pooh on his journey down the Thames.